Families for Life Celebrations 2016 Giveaway! 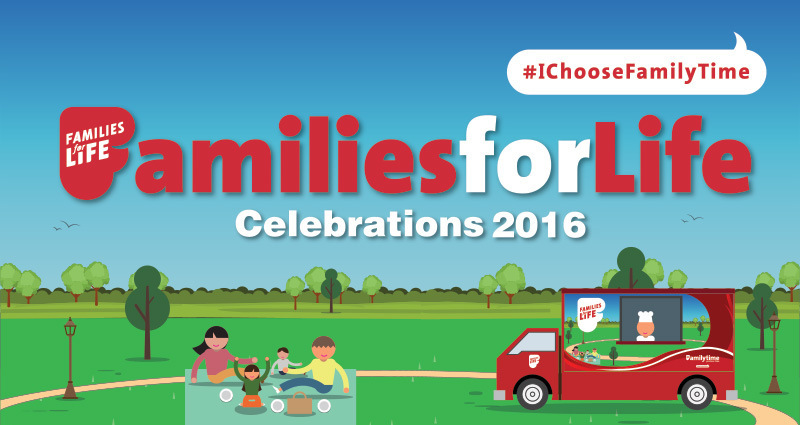 You are at:Home»EVENTS»Families for Life Celebrations 2016 Giveaway! Celebrate the start of the school holidays with your family! The annual Families for Life Celebrations returns this 29 May with a wide array of activities lined up throughout the day to cater to all types of families. The Celebrations, which is held in conjunction with Car-Free Sunday SG, is a platform for families and extended families to spend quality time together and strengthen family bonds. “Get Active with Families for Life” in the morning with an energising walk along closed roads at the Civic District. It’s a great way to bond with your family and extended family, and if you are spotted as the ‘Largest Family Contingent’, you might even win $500 worth of dining vouchers! In addition, no matter if you are a cool dad, mum or grandparent, dress up with your own creative family outfit, and you may stand to bring home the title of the ‘Best Dressed Family’ and a $500 worth of dining vouchers! For those who are especially active, come and sweat it out with family-friendly workouts like Bolly DaZz®, Bokwa® and Zumba. And of course, what’s breakfast without a picnic? Hop down to Empress Lawn and have your very own family breakfast picnic and enjoy some local hawker delights together. Families for Life are giving away free picnic mats too, so grab yours and have picnic at Empress Lawn! Wind down your weekend and “Chill Out with Families for Life” with a relaxing evening picnic, over local music performances and hawker delights. There will also be lots of other fun family-friendly activities such as buskers, arts and crafts, and of course, Families for Life bouncy castles and signature mobile café! Up for more family fun? You can even decorate your own unique family cardboard car and enjoy a unique ‘drive-in’ movie screening experience. Remember to catch the roving photographers to capture your family portrait and make this a truly memorable family time! Register now as a family! Registrants can receive a Families for Life goodie bag (per family) and get a chance at the “sure-win” lucky dip to win prizes worth a total of $30,000. Stand to win family staycations, premium Families for Life picnic bags, a set of special edition Families for Life NETS FlashPay cards with preloaded value and many more! 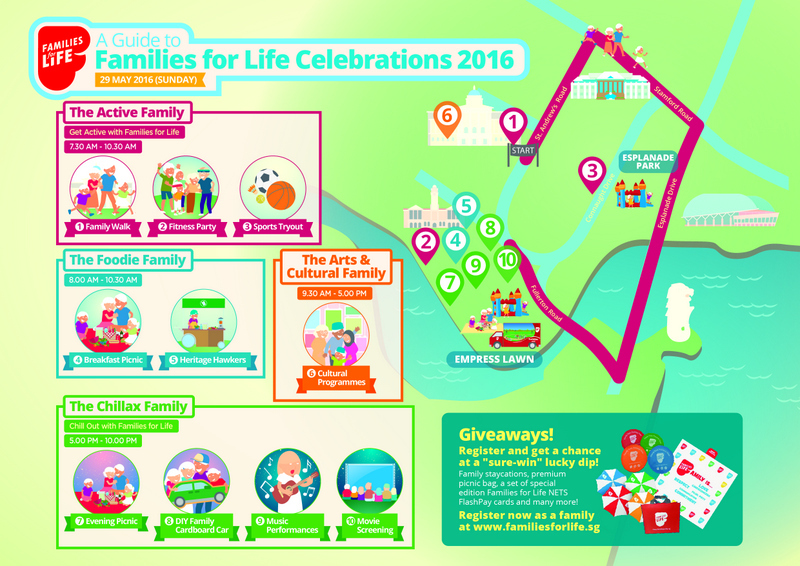 Don’t forget to register for Families for Life Celebrations 2016 at www.familiesforlife.sg to receive a goodie bag and a shot at the sure-win lucky dip! Please click HERE to check out the programme schedule for the list of activities for Families to enjoy and spend quality Family Time together! Families for Life is giving away a Families for Life (FFL) Premium Picnic Bag with cutlery set worth $80 each to THREE lucky winners for you and your family to enjoy! Hurry, giveaway will close on 25 May 2016 at 23:59Hr. Winners will be announced through Website and Facebook. Please ensure that Step 1, 2, 3 and 4 are completed in order to qualify for the giveaway. The entries will be verified by the Organisers. Winners please kindly confirm your prize within 24 hours of announcement of your winning on our Website and Facebook page or another winner will have to be chosen. This giveaway is only for fans of Our Parenting World (OPW). The prizes are proudly sponsored by Families for Life. Thank you so much for your participation in the giveaway. Congratulations! Please also refer to Our Parenting World Facebook announcement. We will be contacting you shortly on your prizes collection. Thank you to our kind sponsor, Families for Life (FFL) for the fabulous prizes for our readers. 1) The prize is as stated, subject to change and fulfillment by the sponsors. Winners are not allowed to change the prizes. The prize will be non-transferable, non-refundable and non-exchangeable for other products/dates/times. The sponsors reserve the right to amend the giveaway contest, substitute any prize or with another of equivalent value without giving notice. 2) All participants have the opportunity to win as long as you have completed and fulfilled all the steps/requirements specified on the giveaway contest. Please make sure your likes and shares are set to public for verification purposes. Incomplete entries and fake accounts will be disqualified at the discretion of the organisers. 3) Winners of past giveaways in the last one month will not qualify for this giveaway, please wait till after one month from the date that you have won to participate in the current giveaways. 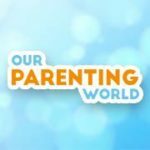 5) The organiser (ourparentingworld.com) is not responsible for inaccurate prize details supplied to any entrant by any third party connected with the giveaway contest and by the sponsors. 6) Winners will be notified by email /Facebook/Instagram after the contest has ended. If the winner cannot be contacted or do not claim the prize, we reserve the right to withdraw the prize from the winner and or pick a replacement winner. 7) The organiser reserves the right to cancel the contest if circumstances arise outside of its control. 8) The sponsor’s and the organiser’s decision in respect of all matters to do with the giveaway contest will be final and no correspondence will be entered into. 9) Other terms & conditions apply. Its on 29 May 2016! Hope to be bless.. Looking forward to have a wonderful bonding day with my family and kids. Hope to bring my family there. It is held on Sunday 29th May 2016!! Families for Life Celebrations 2016 will be held on 29th May 2016.